Echinacea is a genus of perennial, flowering plant in the daisy family (Asteraceae) that grows in the United States and Canada, where it grow in moist to dry prairies and open woodlands. There are nine species of this plant (commonly known as coneflowers), but only three of them are used in herbal remedies: Echinacea Angustifolia, Echinacea Pallida, and Echinacea Purpurea. Some of the plant’s common names are the purple coneflower or black-eyed Susan. The leaves, stems, flowers, and roots are used to produce teas, liquid extracts, and dried herbs. 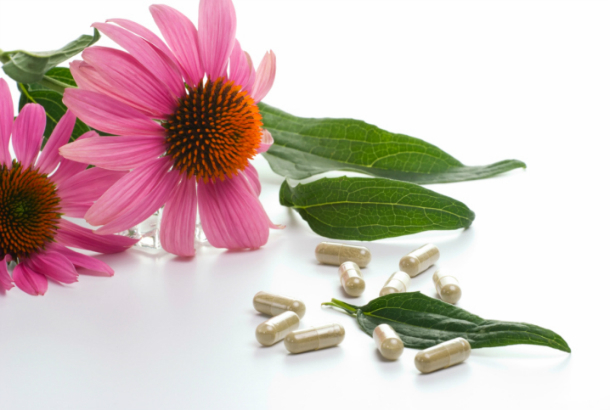 Echinacea is most often taken as a tincture or as capsules because of its somewhat bad taste. However, liquid forms (teas and tinctures) usually are more effective. Echinacea is well known for its antiviral, antibacterial, antifungal, and anti-inflammatory properties. It is thought to encourage the immune system and to reduce the symptoms of colds, flu and other infections and conditions, such as ear infections, urinary tract infections, vaginal yeast infections, genital herpes, bloodstream infections, gum disease, tonsillitis, streptococcus infections, sinusitis, syphilis, typhoid, malaria, and diphtheria. Externally, it can be used as an ointment to treat insect bites, burns, measles, skin ulcers, cold sores, and yeast infections in women. There are also cases in which we can use Echinacea even if they aren’t related to any infection. They include acid indigestion, attention deficit-hyperactivity disorder (ADHD), chronic fatigue syndrome (CFS), dizziness, migraines, pain, and rheumatism. 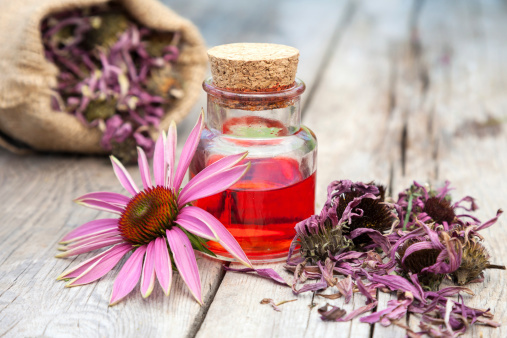 Because Echinacea can enhance immune function, people using immunosuppressive medications should not take this medicinal herb. 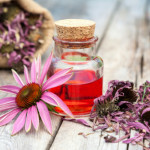 This plant should not be taken for long periods of time without a break, so use it for periods of 6-7 weeks maximum and then take a break of a couple of weeks before using Echinacea again. This medicinal herb is safe. However, some people (especially those who are allergic to ragweed), may have an allergic reaction to Echinacea. 1 teaspoon Echinacea tincture or 2 Echinacea capsules. Take 1 teaspoon of tincture every 1-3 hours, or 1-2 capsules every 2-3 hours for the first day. Then reduce the dosage to 2 teaspoons of tincture or 6 capsules a day. For a chronic infectious problem, take ½ teaspoon of tincture or 2 capsules of Echinacea, 3 times a day for 3 weeks; then abstain for 1 week. 1 teaspoon (1-2 g) dried root or herb (as tea). 0.05-0.1 fl oz (2-3 ml) standardized tincture extract. 0.2-0.3 fl oz (6-9 ml) expressed juice. 20-90 drops (1-3 ml) tincture (1:5). or 15 23 drops (0.75 ml) stabilized fresh extract. As for creams or ointments, apply them as needed for slow-healing wounds.